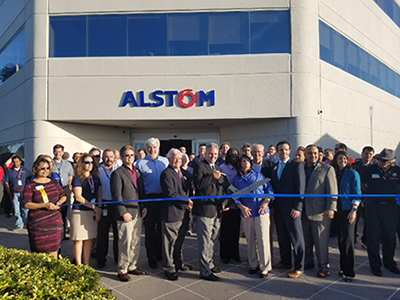 Today, Alstom, global transport signaling leader and market leader in North America, held a ribbon-cutting ceremony in partnership with the Melbourne Regional Chamber of Commerce, at its new location on S. Babcock St., adjacent to the Orlando Melbourne International Airport. Alstom officials Jérôme Wallut, Senior Vice President for North America and David McKay, Vice President Freight & Mining and the Melbourne site leader, welcomed and shared an inside look of Alstoms 55,000 ft2 office and advanced software and solutions test laboratory facility. Attending the ceremony were Brevard County and Melbourne officials, including Mayor Kathy Meehan, Rob Medina, District Director from the Office of Congressman Bill Posey, Melbourne Regional Chamber of Commerce President Michael Ayers, the Chairman of the Melbourne Airport Authority, Jack Ryals, as well as Elizabeth Huy, Senior Manager, Business Development of the Economic Development Commission of Floridas Space Coast. Present in the community for over 25 years, more than 200 employees work at Alstoms Melbourne location, supporting customers such as Class 1 and short line railroads, and commuter and public transit agencies in North America, as well as international freight and mining companies as far away as Tibet, Columbia, and Australia. The facility features office areas on three floors and a newly renovated laboratory occupies the first floor. The laboratory supports engineering teams in Melbourne and Jacksonville, FL, as well as Grain Valley, MO, and allows Alstom to develop and perform hardware and software integration, safety, validation, temperature, and humidity tests prior to implementation in the field for commercial application. Alstom is committed to the city of Melbourne, Brevard County, and the state of Florida, and we are proud to be here today to celebrate our new offices, said David McKay, Vice President, Freight & Mining for Alstom. This site allows us to consolidate all of our laboratories into a single area to capitalize on the expertise of our engineers and software developers to the benefit of our customers, as well as provide us with the opportunity to expand our team to match the size of the North American rail signaling market. Alstom is committed to recruiting from and developing talent in the local area, and works with Florida universities, including the Florida Institute of Technology, University of Central Florida, University of North Florida, and University of Florida, to hire new graduates and offer internships to engineering students. In addition to its Melbourne location, Alstom also has offices in Jacksonville and employs 260 people across Florida. Recent project successes for Alstom in Florida include the design, procurement, testing, commissioning, and safety certification of a new signaling system for All Aboard Florida's brand new Brightline express train passenger service.